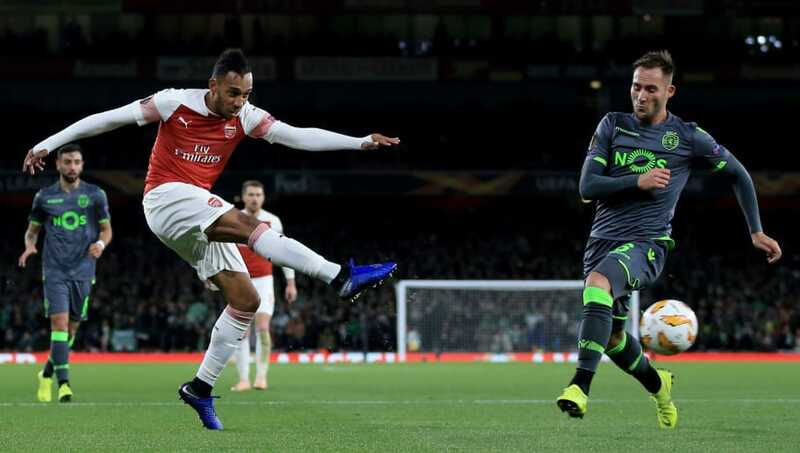 Arsenal secured qualification into the knockout rounds of the Europa League with a goalless draw against 10-man Sporting, though the game was overshadowed by a worrying injury for Danny Welbeck. In a game that failed to spark into life, the injury to Welbeck will perhaps be the biggest concern on Unai Emery's mind as they head back to training on Friday. The England international fell awkwardly mid-way through the first half and appeared to be in agonising pain whilst holding his ankle. In what was a distressing scene, both Arsenal and Sporting players were visibly concerned over the striker's injury and the life of the game seemed to be sucked out of it with Welbeck's departure. Despite Sporting defender Jeremy Mathieu being sent off late on for a professional foul on ​Pierre-Emerick Aubameyang, the Gunners could not capitalise on the man advantage and were held to a draw. However, with FC Vorskla losing to Qarabag, Arsenal's qualification into the knockout rounds was secured, with Emery now potentially having the option of resting players during their remaining two Europa League fixtures. Check out our breakdown of the game below. After producing arguably their best performance of the season in their 1-1 draw with Liverpool last weekend, the biggest question coming into this game for ​Arsenal was whether they could reproduce the intensity and quality shown against Jurgen Klopp's side. Whilst they didn't reach the high standards they set at the weekend, there were some positives in the performance particularly with Emile Smith Rowe shining. However, injuries to both Welbeck and Stephan Lichtsteiner who seemingly suffered a hamstring injury in the second half brought some worrying news for the Gunners. With a busy festive period coming up, Emery will need his full squad ready and available, and significant lay-offs for both would be a damaging blow. Starting XI: Cech (6); Lichtsteiner (7), Sokratis (6), ​Holding (6), Jenkinson (6); Guendouzi (7), ​Ramsey (6); Mkhitaryan (7), Smith Rowe (7), Iwobi (6); Welbeck (6). STAR MAN - In an otherwise flat performance from the Gunners, Emile Smith Rowe was perhaps the only shining light of the evening. Whilst not everything came off for the Arsenal academy product, his willingness to try quick passes and get involved with the build-up play was another reminder of why Emery rates him so highly. WORST PLAYER - ​Aaron Ramsey's contract expires next summer and with the club pulling a potential contract offer, the Welshman looks set to leave on a free next season. After this display, perhaps Arsenal were right in making their decision to let the midfielder go as he failed to dominate proceedings. Whilst he made some good tackles sporadically, Ramsey was not at the heart of Arsenal's game and it is perhaps no surprise that Emery has preferred a midfield duo of Granit Xhaka and Lucas Torreira. After a turbulent summer in which the Sporting fans attacked their own players, and several stars left the club in protest, the Portuguese side had seemingly turned the corner under Jose Peseiro. But after losing a domestic cup match against a second division side in Portugal, the club sacked their manager and Tiago Fernandes took charge in the interim. What Fernandes saw gives Sporting hope for the future, with the side showing a lot of heart and spirit in a well organised display and were rewarded with a hard-earned point at the Emirates . Starting XI: Ribeiro (6); Gaspar (6), Coates (8*), Mathieu (6), Acuna (6); Nani (7), Luis (6), Gudelj (6), Fernandes (5); Montero (6), Diaby (6). STAR MAN - Sebastian Coates is probably most recognisable for his time at Liverpool and Sunderland in the Premier League and never really seemed like he was cut out for the top level. But against Arsenal at the Emirates, he was very solid and reliable, and kept the home side at bay with a goal line clearance in the first half. Jeremy Mathieu alongside him was just as impressive until he found himself sent off for bringing down Aubameyang with the striker set to go through on goal. WORST PLAYER - Having been capped at international level with Portugal, Bruno Fernandes would have been expected to deliver for his side particularly with some of the team's key players moving on in the summer. However, his creative talents were on the periphery of the game and failed to really get involved in his side's rare forays into the Arsenal half. With qualification now secured, Arsenal can now solely focus their attentions on the ​Premier League for the upcoming months. A top-four place and a return to the glamour of the Champions League is the priority for Unai Emery's side this season, and they take on ​Wolves at the Emirates on Sunday afternoon looking to keep pace with the sides above them. For Sporting, interim manager Tiago Fernandes will likely oversee the club's next few fixtures, certainly until a permanent manager can be named. Fernandes himself may fancy the job and will look to further impress in his caretaker-role as he leads the side in a home fixture against Chaves on Sunday evening.